A rapper has been jailed for the manslaughter of his girlfriend who died after suffering a fatal reaction to a so-called party drug. Stephen Nicholson appeared at Winchester Crown Court, where he was told his case would be brought before a jury next May. 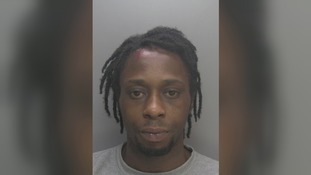 David Afolabi, 28 from London has been sentenced to over a decade behind bars at Winchester Crown Court. He pleaded guilty to 10 charges. A yachting company boss has been found guilty of failing to ensure the safety of the Cheeki Rafiki yacht in which four sailors were killed when it capsized in the mid-Atlantic. A jury at Winchester Crown Court convicted Douglas Innes, of Whitworth Crescent, Southampton, for failing to operate the yacht in a safe manner. His company, Stormforce Coaching Limited, was also convicted of failing to operate the yacht in a safe manner. The jury has been discharged, but have failed to reach a verdict on manslaughter charges against Douglas Innes. Innes, 42, showed no emotion as the chairman of the 11-person jury announced the verdicts for the two charges which were reached by a majority of 10-1. The trial has heard that the Cheeki Rafiki lost its keel as the crew were returning the 40ft yacht from Antigua to the UK in May 2014 when it got into trouble more than 700 miles from Nova Scotia. The US Coastguard was criticised for calling off its search after two days but after protests from family and friends and intervention by the British government, the search was restarted and the boat found but without any sign of the four men. He said the yacht, which had grounded on three occasions in the past three years, had an undetected fault with bolts holding the three tonne keel to the hull which then failed causing it to fall off in bad weather during the voyage. Mr Lickley said the yacht was not appropriately coded - licensed for the voyage - and Innes had chosen an "unsafe" northern route" because it was shorter and enabled the yacht to return back to the UK in time for booked charters of the vessel. He said that Innes had a "duty of care" to the four men and "not to save money at every turn" and not to put "profit over compliance" with the yacht's coding, or commercial certificate, with the Yacht Designers and Surveyors Association (YDSA). The trial also heard that when Innes received an email from the skipper, Mr Bridge, headed as "urgent" he carried on drinking in a pub before only later alerting the Coastguard. He also denied he had cut costs or tried to save time by sending the yacht back to the UK via the northern route. The manager of a fruit packing operation in Hampshire has gone on trial accused of the manslaughter of two of his workers. Scott Cain and Ashley Clarke, both in their twenties, died after falling unconscious in a building used to store apples at the Blackmoor Estate near Liss in Hampshire. The building did not have enough oxygen in it and the prosecution says employees were "encouraged" to go in without breathing apparatus. Andrew Stocker, their manager, denies the charges. The trial continues. Andrew Pate sent this report from Winchester Crown Court. The manager of a fruit packing operation has gone on trial accused of the manslaughter of two workers. Scott Cain and Ashley Clarke died after going into an oxygen deprived unit at the Blackmoor Estate near Liss in Hampshire. The prosecution says their manager, Andrew Stocker, "approved and encouraged" employees to go into the containers without breathing apparatus. He denies two charges. Two men have been sentenced to over 14 years in prison after an investigation into the supply of a class A drug. Paul Neale, who is 26-years-old and from Sandhurst and 32-year-old Adam St George from Bracknell were found guilty of conspiracy to supply cocaine in Hampshire, Surrey and Berkshire. Another man from Bracknell Christopher Evens was sentenced to a two year suspended sentence and fined £8000. Two other men on the trial were found not guilty. Speaking after the sentencing, officer in the case Detective Constable Frank Cregan from Hampshire Constabulary's Serious and Organised Crime Unit, said, "The sentences bring what has been a very detailed and challenging investigation to a close. "In the course of our investigation we have seized £160,000 and just over five kilos of cocaine and amphetamine to the street value of £417,765." A man who forged a pilot's licence so he could fly commercial aircraft into and out of Gatwick Airport has been jailed for three years. Sixty-one year old Michael Fay was a former American Air Force pilot. He moved to Britain and lived in Alton in Hampshire. Fay was convicted at Winchester Crown Court of faking papers to get a job with a Libyan airline. Our presenter Amanda Piper spoke to our reporter Mel Bloor about the case. Click here for the reaction from Hampshire Police, who were involved with the investigation.